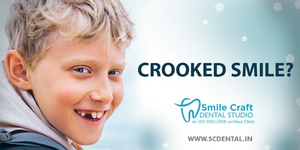 Smile Craft Dental Studio – ISO 9001 : 2008 certified, “Best Clinical Practice” Award winning multispeciality dental Hospital in Ahmedabad, Gujarat. Provider of Cosmetic, Restorative and Implant Dentistry. Exepertise in Pediatrics and Orthodontic Treatments. Various membership plans available for Couple/Family, can avail heavy discounts on General dentistry procedures. Call us now on (91) 079-40088720 and fix the appointment.